Several of you have remarked about the current header photo on my blog. 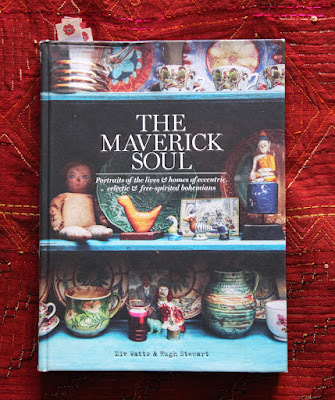 This is a photo taken by Rikki Snyder from my new book Crafting a Colorful Home. The project is called The Scrap Yarn Knit Afghan. I designed it to be a project that can be knit over the years. The afghan is made in 5 pieces that are then seamed together. The vertical edges are picked up and worked in garter stitch. This is the kind of project that you can pick up and put down many times. The stitch pattern is easily memorized and it is worked back and forth on a circular needle. The stitch is called Reverse Stockinette Stitch Ridges and is an easy stitch I return to again and again. It looks good on both the front and the back. It is the stitch I used to make my very favorite extra long scarf that I wear every day of the winter and have worn for at least the last ten years. Can you believe I haven't lost it? I love this scarf. 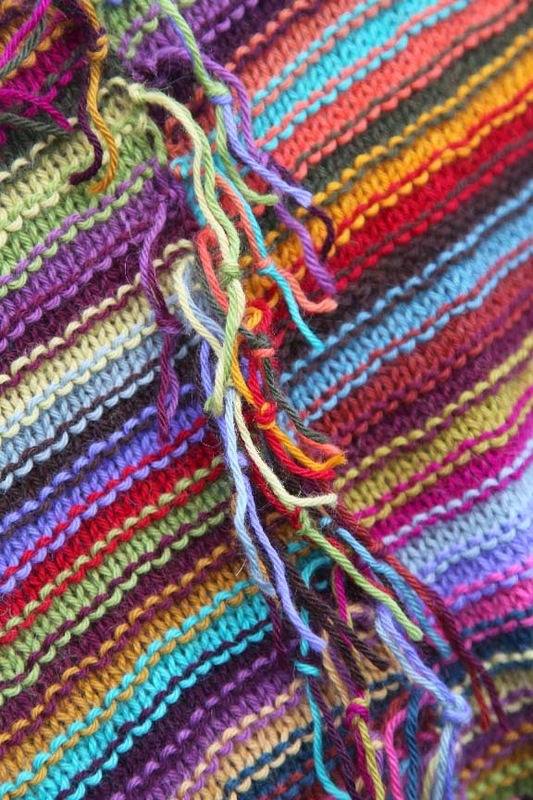 To accommodate the changes of colors and the ends, I looped some new pieces of each color yarn at the end of each stripe. Then I braided them to form a heavy fringe that has worn well over the years. 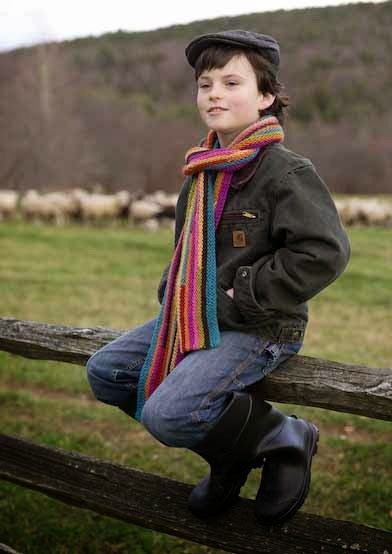 I do not have a pattern for my favorite scarf but there is a similar one in my book Color By Kristin. It is shown on Matthew below. What a cute boy. He is almost 17 now. How do they grow so fast? Back to the afghan. Here is how I handled the backside. I tied the ends close to the fabric. I then tied the tails again, a little farther from the fabric. 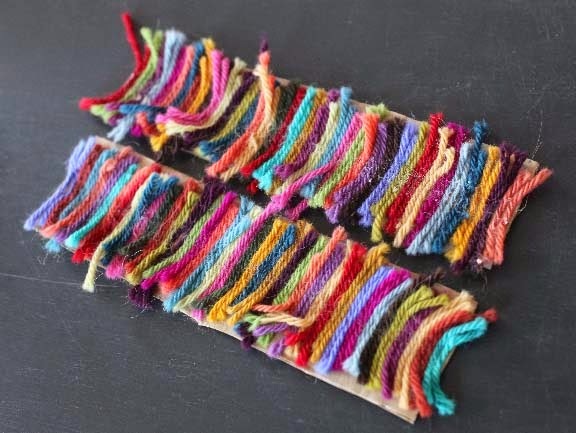 This will hold the yarn tight and creates a decorative fringe that will felt and mingle together over the years. Although it is not a finish that all of you will love (I can never make everyone happy), it is an alternate to weaving in lots and lots and lots of ends. I wouldn't recommend the fringe finish for baby blankets as little fingers may get stuck. The secret to making this afghan successful is the placement of the colors in the stripe pattern. As you can see, there are no repeating patterns of colors - it is all random. That was the idea - as if the colors were being pulled out of a knitting bag in no random order. There was a plan though and I will let you in on it. Before I sent the Color By Kristin yarn out to be knit, I wanted to make sure my knitter Bonnie knew what I was looking for with the "random color placement." I worked up a little "cheat sheet". I cut 2 strands of each color yarn about 3" long. Then I cut two pieces of cardboard 2" wide and about 8" long. I covered the cardboard pieces with a central stripe of glue. 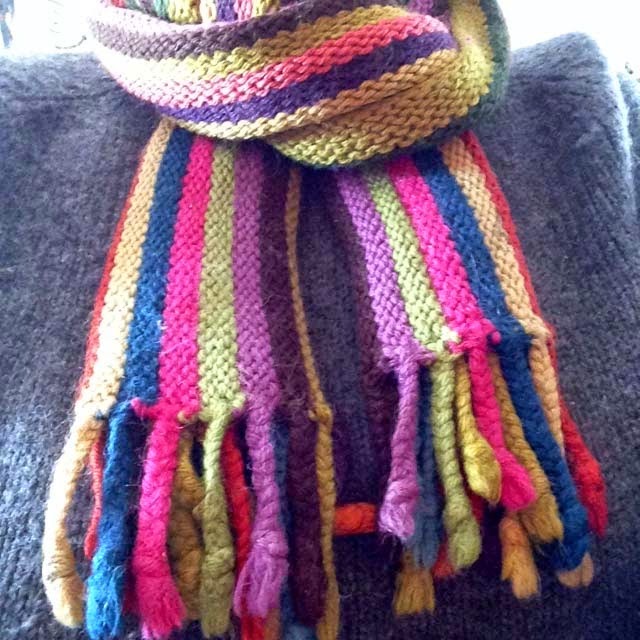 I arranged 2 strands of each of the colors next to each other as I wanted them knit. I didn't want colors that were too close in value (lightness and darkness) next to each other. Nor did I want colors that were to similar next to each other (like orange and gold, or green and teal). The exception to this rule would be two similar colors but one very light and one very dark. I wanted the stripes to pop against each other. I know this look isn't for everyone because the colors are very saturated. Some of you prefer more sedate projects, less colorful. That is okay. You can use your own color sense and odds and ends. Color By Kristin is a worsted weight wool/mohair/alpaca but you can use any weight of yarn - as long as all the colors are the same weight yarn. A heavier yarn will make a larger afghan; a thinner yarn will make a smaller afghan. If you want a smaller afghan than the original, omit a section and shorten the length. Yesterday in the mail, I got this sweet little illustration from Shell, one of my longtime readers and commenters. Thanks Shell. Love it! Your book is on the way. I love the afghan and the illustration! 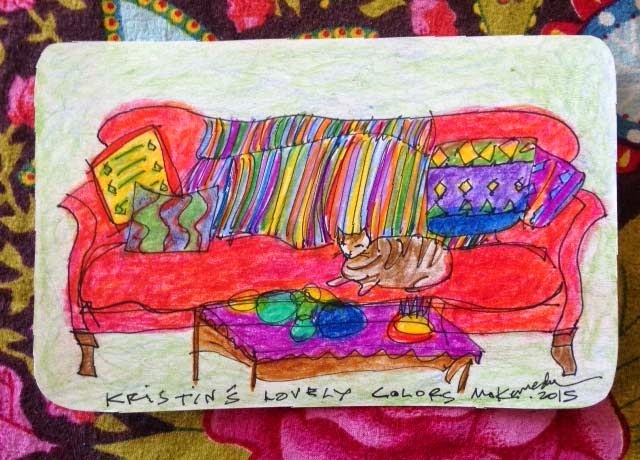 What a fun surprise & how kind of you to post my illustration inspired by your lovely colorwork. I can't wait to receive Crafting A Colorful Home. I appreciate, as well, your detailed tutorial of sewing a fabric back to a knit pillow, . . something I've yet to learn. 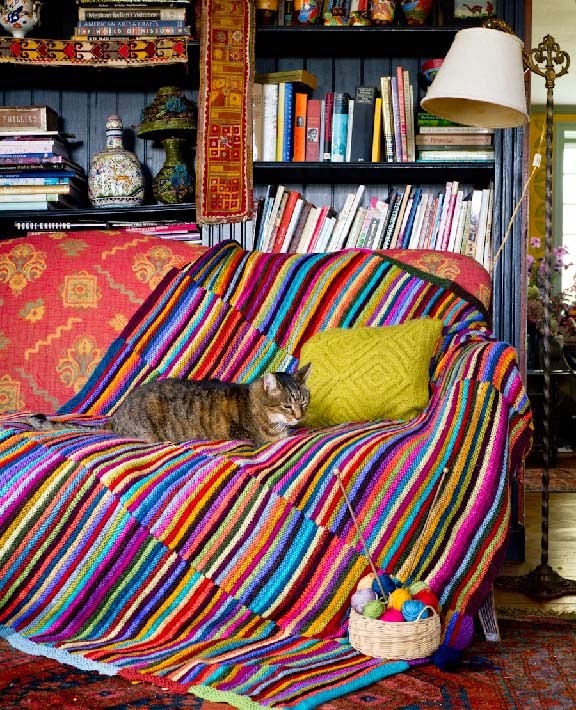 The afghan is joyously singing its color song & the kitty certainly enjoys it too ! Thank you again for the nice surprise. Its glorious sun here, in WI, with today being the * 1st picnic of the year * with my three year old friend, Nolan, who dearly appreciates a good tea cup and patterned napkin ! Lovely afghan and beautiful illustration, and your header is gorgeous. That's an amazing blanket/afghan. I love the way the colours work together and they so have that 'pop' that I'm always trying to achieve. I shall try out that stitch for a scarf - it looks lovely and warm. Your friend is such a talented illustrator - captures your lovely colourful home. Have a lovely weekend - I'm helping our daughter move into her first studio flat of her own. Anyway, I have a question: I'm not very skilled at embroidery (I'm definitely more of a knitter) but all I have at home is cotton floss. 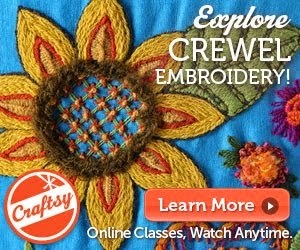 Is crewel wool easier to work with? I'm tempted to order some from your website to see if my kids can handle it better. The floss they've been using (old stuff I inherited from grandmothers) tends to twist and tangle. Hi Suze - Yes - you are so correct that crewel wool is much easier to stitch w/ than the cotton floss. It fills in much better and looks better. That is a great factor with kids because they feel so good about what they are doing when it looks good. You might want to order just the small sample package from my website which has 10 colors in it that I think will appeal to your kids. If you have any felt (I prefer wool but acrylic will do) it is also a great fabric for kids to stitch on. I do think that sometimes the older floss can be more difficult to stitch w/. I barely stitch w/ cotton because I so much prefer the wool. Can't wait to see what your son stitches. That is awesome! Thanks so much for your thoughtful response! Hi Suze - My mom always bought us the best supplies when we were learning to sew and stitch -not outrageously expensive but not cheap-o. I do believe that is why I got sucked into all this - the colors and textures, etc. So, yes I believe that good supplies help kids learn b/c they are easier to work with. Quilting cotton is okay w/ cotton floss if you separate it down but it won't work w/ the wool thread. Best to use wool or wool blend felt and linen fabric w/ the wool thread. I'm enjoying my copy of Crafting a Colorful Home and my first project is this blanket/throw! I already had a collection of your yarns and I filled out what I needed from the colors available at Webs. Of course, that means I'm not using exactly the colors you did, but I love the way so many of them look together and I'm having a blast.